This Knorr Homestyle Stock holiday post about a far from low-cal side dish may seem odd on the heals of what I wrote last week. But like I said – I eat both low and high calorie foods in my day-to-day life! It’s really all about moderation and portion size…Two things that only briefly cross my mind when I sit down to a holiday feast… for about half of a second before the dishes start being passed around! I always end up taking a small serving of everything, which generally means an overflowing plate once the dust has settled. But that’s why you make side dishes like these glazed carrots to go along with items like this corn pudding with rosemary, caramelized onion & roasted garlic jam and chevre. Did you just drool a little? I did, while typing it. One little confession: I didn’t dream this one up all by myself! I put a call out to my awesome facebook friends to let me pick their brains for their favorite holiday dishes. 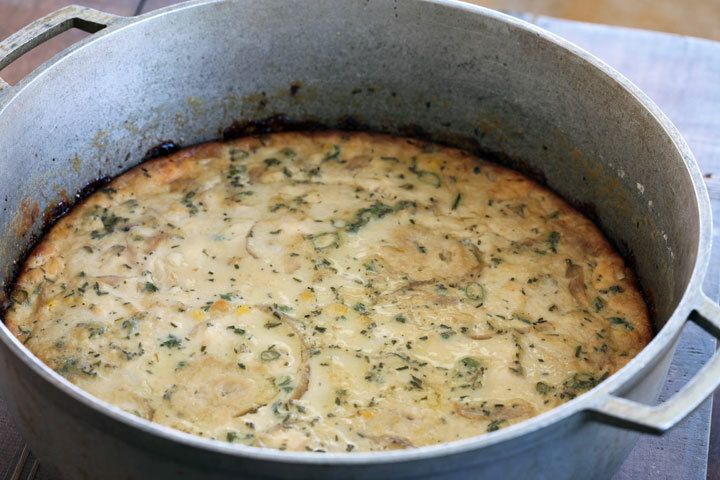 One of my friends from high school, Suzanne, said that she always looks forward to corn pudding – a classic regional side dish in the south western part of Virginia where I grew up. Another friend, Ayla, suggested a sweet potato & caramelized onion-roasted garlic jam casserole. Bada bing bada boom! Why not merge the two? And throw in some chevre and while we’re at it. When is chevre a bad idea? It plays well with both sweet and savory, which this dish has aspects of both. So thank you, Suzanne and Ayla, for helping a sister out! Now I want to pick your brain too! What are some of your favorite holiday dishes? One that makes me nostalgic is sauerkraut slowly braised with pepperoni and pork. Not a dish that most people would consider a traditional American holiday food, but it made an appearance at every Thanksgiving & Christmas of my youth due to my mom’s eastern European roots. Can’t wait to hear your what favorites are! Preheat a large saute pan over low heat for 3 minutes. Add butter to the pan. Once butter has melted, add the onions. Stir. Cook onions over low heat until caramelized and melting, about 35 - 45 minutes, stirring occasionally. Once caramelized, add the rest of the ingredients to the pan, stir and raise heat to medium. Allow jam to come to a simmer then cook for another 3 minutes, stirring occasionally. Remove from heat and cool to room temperature. Store in the refrigerator until needed. Jam can be made up to 2 days in advance. Preheat oven to 350 degrees. Grease a 3 quart casserole dish and set aside. In a large mixing bowl, whisk together eggs and sour cream until smooth then add milk & buttermilk. Whisk until incorporated. While continuing to whisk, slowly pour in cornmeal to prevent clumping. Add the rest of the ingredients and stir until evenly combined. Pour corn pudding into greased casserole dish. Bake in preheated oven at 350 degrees for 55-65 minutes edges are golden and a knife inserted into the center of the pudding comes out clean. I’m looking forward to your follow up post about your weight loss. You are an inspiration to me. As for the recipe today. WOW! Looks so yummy! Might have to try making it for a pot luck get together so I can share. That looks delicious! The carmelized onion and garlic jam is genius! Holy flipp’n batman! That looks beyond deeelish. I would elaborate, but I’ll keep my comments G-Rated (for now).